Laser Connection to the rescue!! Putting Windows XP out to pasture. The wonderful world of mobile printing. Could your printer be a target for hackers? Laser Connection has been serving the technology needs of clients in the Mid-Michigan area since 1989. Providing quality office products and first class service, Laser Connection is your total office solution. Laser Connection carries a wide range of products from toner and ink cartridges, select brands of printers and multifunction copiers, computers and network hardware, to the most basic office needs like paper, paper clips and file folders. 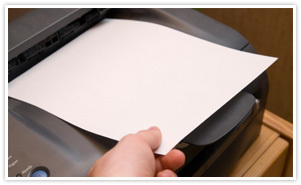 Laser Connection is the area’s premier service provider for laser printers and multifunction devices. We can also help you plan, implement and maintain your office computer network, as well as everything attached to it. We’ve been there and fixed that! Laser Connection carries over 40,000 different office and technology products. If your office needs it, we’ve got it! Click to view our online catalog. specialist, or request a quote.